For other uses, see Eastleigh (disambiguation). The town lies on the River Itchen, one of England's premier chalk streams for fly fishing, a designated site of Special Scientific Interest. A Supermarine Spitfire Mk IX flown by Ray Hanna at Flying Legends 2005. The modern town of Eastleigh lies on the old Roman road, built in A.D.79 between Winchester (Venta Belgarum) and Bitterne (Clausentum). Roman remains discovered in the Eastleigh area, including a Roman lead coffin excavated in 1908, indicate that a settlement probably existed here in Roman times. A Saxon village called 'East Leah' has been recorded to have existed since 932 AD. ('Leah' is an ancient Anglo-Saxon word meaning 'a clearing in a forest'). There is additional evidence of this settlement in a survey from the time which details land in North Stoneham being granted by King Æthelstan to his military aid, Alfred in 932 AD. The prefix 'Est' or 'East' is thought to refer to its location relative to the established settlement of Baddesley. The Domesday Book of 1086 gives a more detailed account of the settlement, which is referred to as 'Estleie'. In 1838 the London and South Western Railway Company (L&SWR) built a railway from Southampton to Winchester. It was decided to build a station near the little village of Barton. This railway station was originally named Bishopstoke Junction. In 1868 the villages of Barton and Eastley were combined into one parish. A parish church, the Church of the Resurrection, was built in the same year, at a cost of £2,300. A local noted author of many novels, Charlotte Yonge, donated £500 towards the building of the church. She was rewarded by being given the privilege to choose a name for the 'new' parish; either Barton or Eastly. She chose Eastly, but with a new modern spelling; Eastleigh. In 1891 the L&SWR Carriage and Wagon Works from Nine Elms in London were transferred to Eastleigh. This was followed by the Nine Elms Locomotive Works which were moved there in 1909. These railway works were closed in 2006 but have since reopened, albeit on a smaller scale. Eastleigh has seen a rapid and controlled expansion in residential, industrial and commercial development over recent years. The borough of Eastleigh was ranked the "9th best place to live in the UK 2006" by a Channel 4 programme. The United States Navy established a naval air station on 23 July 1918 to assemble and repair Caproni Ca.5 and Airco DH.4 and DH.9 bombers for the Northern Bombing Group of the First World War. The base closed shortly after the First Armistice at Compiègne. Perhaps Eastleigh's best-known 'resident' is the Spitfire aeroplane which was built in Southampton and first flown from Eastleigh Aerodrome. A replica has recently been placed on the roundabout at the entrance to the airport. Eastleigh Museum, which is to be found in the High Street, holds information about the town and the surrounding villages, including Bishopstoke which had been the largest residential area. Eastleigh has two further education colleges: Barton Peveril Sixth Form College (where Colin Firth was a pupil) and Eastleigh College (both on the same road). Secondary schools include Crestwood College and primary schools include Cherbourg Primary School, Norwood Primary School, Nightingale Primary School, the Crescent Primary School and Shakespeare Infant and Junior Schools to the north of the town. The Anglican parish church is All Saints in Desborough Road. The Roman Catholic Church of the Holy Cross was built in Leigh Road in 1902 to replace an early tin church. Emmanuel Baptist Church was founded in the early 1930s, in the former Desborough Mission Hall in Desborough Road. The building dates to 1905. Eastleigh F.C. are the town's sole senior football team playing, from 2014–15, in the Conference Premier (after promotion from the Conference South in 2013–14) as well as entering the FA Cup and the FA Trophy. Solent Kestrels are the town and area's basketball club, and compete in the English Basketball League Division 1, the second highest level of the sport in the country, behind the nationwide British Basketball League. The team were promoted to Division 1 in 2016, after finishing as champions of Division 2 in the 2015-16 season. They are coached by Matt Guymon and play home games at the Fleming Park Leisure Centre. Eastleigh Ladies Hockey Club is based in South Hampshire. It fields 2 teams in the Hampshire Women's League (playing Saturdays), as well as playing floodlit and indoor league games (playing on weekdays). Eastleigh Rugby Football Club play from "the Hub" in Eastleigh. They currently have four senior sides, colts and young player development, their 1st XV currently play in the London 3 South West. Also based at the Hub are "the Hurricanes", a team for young adults with learning difficulties. There is a broadly based running club. Eastleigh is represented in the House of Commons by Conservative MP Mims Davies. She was first elected for the constituency at the 2015 general election with a majority of 9,147 votes, taking over from Mike Thornton of the Liberal Democrats. Mike Thornton was elected at the 2013 by-election with a majority of 1,771 votes after the resignation of Chris Huhne, in a by-election that was closely fought with UKIP coming in second and the Conservatives finishing in third place. In 2005 Huhne had been elected as the Liberal Democrat Member of Parliament (MP) for the Eastleigh constituency after the previous MP (David Chidgey, also Liberal Democrat) retired. Eastleigh has a tradition of close contests, and Huhne narrowly beat the Conservative candidate Conor Burns with the second lowest swing against the Liberal Democrats of any seat with a retiring MP (2.6%). David Chidgey had succeeded the Conservative MP Stephen Milligan after his high-profile death. Chris Huhne was appointed as Secretary of State for Energy and Climate Change following the 2010 general election. Huhne resigned the seat in February 2013 after pleading guilty to perverting the course of justice over a 2003 speeding case. Eastleigh Borough Council currently has 32 Liberal Democrats, 4 Conservative and 3 independent Councillors. The B&Q head office is on Chestnut Avenue in Eastleigh (technically Chandler's Ford). The town was formerly home to a Mr Kipling bakery. It is now home to a manufacturing plant owned by Prysmian Cables & Systems. Southampton Airport (IATA: SOU, ICAO: EGHI), the 20th largest airport in the UK, is located in Eastleigh. Southampton Airport is served by a dedicated mainline railway station, Southampton Airport Parkway, which is the next station stop south (5 minutes) from Eastleigh. Eastleigh is served by Eastleigh railway station, a mainline station on the South Western Main Line from London Waterloo (80 minutes away) and Winchester to Southampton, Bournemouth and Poole, with South Western Railway services to those places. It is also the junction station for two other routes, the Eastleigh-Fareham line and the Eastleigh-Romsey line. Eastleigh has bus services provided by Stagecoach South, Bluestar, First Hampshire & Dorset, Wilts & Dorset and Xelabus. 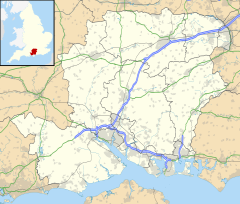 Eastleigh is also located close to the junction between the M3 motorway and M27 motorway, giving easy road access to London, Southampton, Winchester, Bournemouth, Portsmouth and places between. The Swan Shopping Centre opened in 1989, and was built in the heart of the town's Victorian 'grid iron' road layout and blocked off Market Street and High Street – although through access was possible for pedestrians while the centre was open. The Swan Centre included a French-style café and a new library (replacing the recently demolished Town Hall Library) in the High Street atrium. See also: Category:People from Eastleigh. The most famous people linked to Eastleigh are probably Christabel Leighton-Porter, the model for the Second World War cartoon character Jane, and Benny Hill who both lived in the town. Hill's first job was at Woolworths on Leigh Road, Eastleigh. He then moved on to be a milkman for Hanns Dairies, on Factory Road, now Wells Place. His time working in Eastleigh on a horse-drawn milk float gave him his inspiration for his hit record, Ernie, The Fastest Milkman In The West. In Hill's honour, a plaque has been put up close to the site of the now demolished Hanns Dairies building and a new road has been named Benny Hill Close, though many of the people who had bought the new homes were not happy with the decision. An alternative suggestion was Cowpat Lane. Sir Arthur Young, the eminent police chief, was born at 55 Chamberlayne Road in 1907. Sporting notables include Tommy Green who won an Olympic Gold Medal at the 1932 Los Angeles Games in the 50K walk, and Vince Hawkins who was British Middleweight Boxing Champion in the late 1940s. Clarke, Kathleen (1995). First (ed.). Civic Pride: Engendered and Remembered. Eastleigh: K M Clarke B.A./ Boyatt Wood Press, Southampton. ISBN 0-9526565-0-7. Gosling, Nicola; Bowie, Gavin (1986). Estleie: from 1086–1936, the development of Eastleigh as a community. Winchester: Hampshire Record Office, Hampshire County Museums Service & Eastleigh Borough Council. Unique ID:hs-hl-hb200025746-b-00-000. Retrieved 27 March 2010. Hill, Paul (2004). The Age of Æthelstan: Britain's Forgotten History. Stroud, United Kingdom: Tempus Publishing & The History Press. ISBN 978-0-7524-2566-5. Retrieved 28 March 2010. Hillier, Barbara (January 1994). Chandler's Ford: A Pictorial History. Phillimore & Co. Ltd. ISBN 978-0-85033-896-6. Retrieved 29 March 2010. Robertson, Kevin (7 April 2009). Steam Around Eastleigh. Stroud, United Kingdom: The History Press. ISBN 978-0-7524-5035-3. Retrieved 26 March 2010. Winkworth, Bob (January 2007). Eastleigh: the railway, the town, the people. Noodle Books. ISBN 978-0-9554110-0-7. Retrieved 26 March 2010. ^ "Archaeology Object Database – Southampton City Council". sccwww1.southampton.gov.uk. Southampton City Council. Archived from the original on 19 April 2010. Retrieved 28 March 2010. ^ "VENTA BELGARVM". roman-britain.org. Archived from the original on 16 January 2010. Retrieved 28 March 2010. ^ "Hampshire Treasures: Volume 13 ( Eastleigh), Page 3 – Bishopstoke, Entry 04". hants.gov.uk. Archived from the original on 5 June 2011. Retrieved 29 March 2010. ^ a b "Bishopstoke Parish Council: History". bishopstokepc.hampshire.org.uk. Archived from the original on 27 February 2011. Retrieved 28 March 2010. ^ "Chandlers Ford – Local History". chandlersfordonline.com. Archived from the original on 9 March 2009. Retrieved 29 March 2010. ^ a b c d e "A History of Eastleigh". www.localhistories.org. Retrieved 21 December 2009. ^ "Bishopstoke Parish Council website". bishopstokepc.hampshire.org.uk. Archived from the original on 26 May 2010. Retrieved 28 March 2010. ^ "BEST AND WORST PLACES TO LIVE 2006: Eastleigh". Channel 4. Archived from the original on 3 February 2008. Retrieved 16 November 2007. ^ Van Wyen, Adrian O. (1969). Naval Aviation in World War I. Washington, D.C.: Chief of Naval Operations. p. 80. ^ "Hampshire schools by area: Eastleigh". Hantsweb. Hampshire County Council. Retrieved 28 October 2013. ^ "Eastleigh Parish". Easleigh Parish. Retrieved 6 November 2018. ^ "History". Holy Cross [ The Catholic Parish of St Swithin Wells. Archived from the original on 12 September 2016. Retrieved 6 November 2018. ^ Kelly's Directory of Southampton and Neighbourhood. http://www.plimsoll.org/Southampton/streetdirectories/directory1907/default.asp#13. 1907. pp. 512 & 516. ^ "Eastleigh Running Club". eastleighrunningclub.org.uk. ^ Norman Smith (3 February 2012). "BBC News – Chris Huhne quits cabinet over speeding claims charge". BBC.co.uk. Retrieved 12 March 2013. ^ "Company Information." B&Q. Retrieved on 25 March 2012. "B&Q Plc B&Q House Chestnut Avenue Chandlers Ford Eastleigh Hampshire SO53 3LE "
^ "Swan Shopping Centre Eastleigh". 2007–2009 Swan Shopping Centre, Eastleigh. Retrieved 27 June 2009. ^ "Racy Cartoons of the WW II Years: "Jane"". skylighters.org. ^ "Late 20th Century". eastleighso50.tripod.com. Retrieved 27 March 2010. ^ "Benny Hill saluted by the south". BBC News. 6 August 2009. Retrieved 29 March 2010. ^ a b "Eastleigh". Southern Life. Archived from the original on 7 April 2010. Retrieved 29 March 2010. ^ Adams, Melanie (2 December 2008). "Post-war boxing champion Vince Hawkins dies aged 85". Southern Daily Echo. Southampton. Retrieved 20 December 2009. ^ "Vince Hawkins". Boxrec Boxing Encyclopaedia. Retrieved 20 December 2009. ^ a b c "Twin Towns & Twinning Association". Eastleigh Borough Council. Retrieved 30 July 2015.